Bridal Bracelets There are 19 products. Combining modern elements with vintage appeal, this Assorted Pearl & Crystal Quartz Wedding Bracelet will lend a touch of sophisticated shimmer to any bridal ensemble. 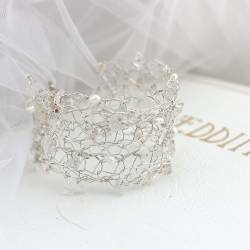 Prepare to dazzle on your wedding day with this exquisite Bridal Cuff. Handcrafted in gold or silver plate to complement every taste, with the natural beauty with pearls, crystals and moonstone. Refined and elegant, this Bridal Pearl and Swarovski Crystal Bracelet coordinates beautifully with all wedding gowns and bridesmaid dresses. A stunning wedding day gift for brides and bridesmaids. Personalise this Bridesmaids Pearl and Swarovski Crystal Silver Charm Bracelet with any initial to create a bespoke wedding day keepsake for your bridal party. 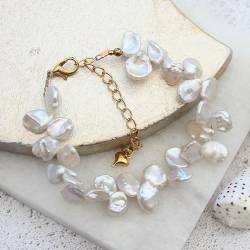 A thoughtful gift for bridesmaids and flower girls, this stunning Wedding Birthstone Charm Pearl Bracelet can be personalised with any initial and Swarovski Crystal Charm Birthstone. A modern twist on a traditional pearl bridal bracelet, this Personalised Silver Charm Bracelet with gemstone birthstone makes a stunning wedding keepsake gift for your bridesmaids and flower girls. 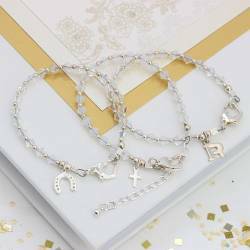 Customisable to complement each member of the bridal party, a Personalised Silver & Pearl Charm Bracelet with Swarovski Crystals is the perfect wedding day keepsake for bridesmaids and flower girls. 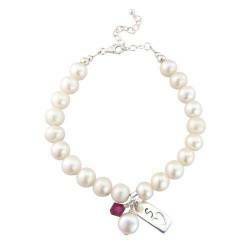 From our hugely popular personalised bridal jewellery collection, this Bridesmaids Pearl Birthstone Crystal Charm Bracelet is a gorgeous keepsake for bridesmaids and flower girls. Naturally radiant, this Double Strand Pearl Bridal Bracelet complements traditional wedding gowns to perfection. A bespoke piece of wedding jewellery for sophisticated brides, it oozes vintage charm. 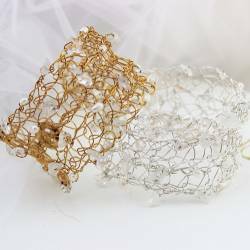 Presented in silver, yellow or rose gold to complement every wedding day aesthetic, this Handmade Filigree Wedding Cuff Bracelet with Pearls, Moonstone and Crystals makes a stunning bridesmaid gift. Anything but traditional, a Gold and Pearl Wedding Charm Bracelet lends modern elegance to your bridal outfit. Eye-catching and beautiful, a lovely wedding keepsake for bridesmaids and flower girls. The Luna Personalised Pearl and Swarovski Crystal Bridal Bracelet is the epitome of understated glamour. A timeless jewellery piece for sophisticated bridal parties, a perfect wedding day gift. Prepare to dazzle on your wedding day with the Octavia Quartz Wedding Bracelet. 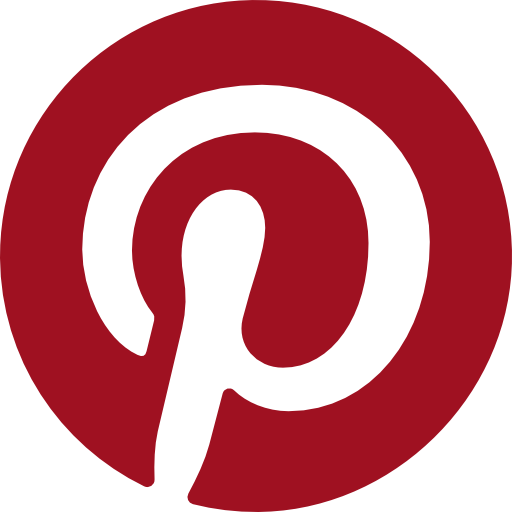 Eye-catchingly beautiful, it coordinates beautifully with both modern bridal creations and vintage style wedding gowns. Chic, sophisticated, and fabulously feminine, this statement Pearl Cuff Bridal Bracelet oozes vintage glamour. A stunning piece of wedding jewellery for modern brides. A modern twist on classic pearl wedding jewellery, this Sterling Silver Coin Pearl Bridal Bracelet will make an eye-catching addition to your wedding day. A lovely gift for brides and bridesmaids. 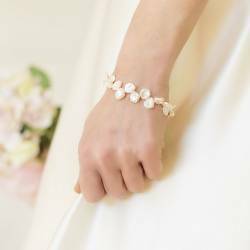 Unique and beautiful, the Keshi Pearl Wedding Bracelet will add a touch of natural radiance to your wedding day ensemble. A timeless treasure for sophisticated brides, or a stunning wedding day gift. 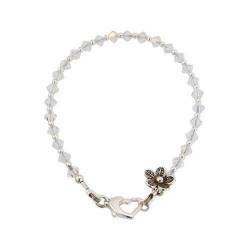 Symbolising love, luck and happiness, the Keshi Pearl Wedding Bracelet features a stunning 4 Leaf Clover Charm. A fabulous piece of wedding jewellery for superstitious brides.